In this article, I’ll show you an example on how to integrate the PostgreSQL C++ library into your C++ project solution. The PostgreSQL version that i am using for this example is PostgreSQL for Windows version 8.4.4. In case you don’t have PostgreSQL installed on your machine, you can download it at postgresql-8.4.4-1-windows.exe. You may need to provide some details first before start to download. Make sure that you have installed PostgreSQL successfully and please REMEMBER your password to login to PostgreSQL through its command console windows in later. Let’s start to create a database for this example now. 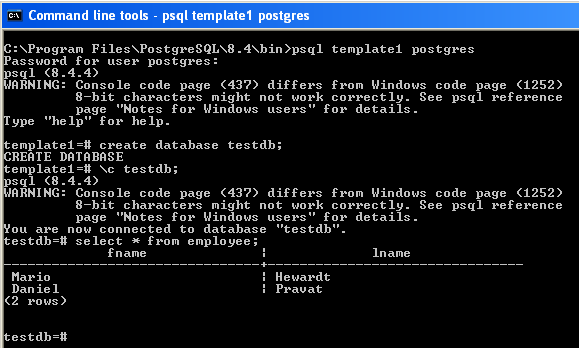 Run the psql in the command windows and create a new database named “testdb” as the following screen shot. Once the database has been created, we are now ready for the coding part. Let’s create a Win32 console application now (I am using visual studio 2005 for this example). The first task we need to do right now is to include the PostgreSQL C++ interface header file and lib to our project. You can do that by right click your project solution and click properties. Note 1: You might need to change the following file path accordingly. [C/C++ -> General -> Additional Include Directories] C:\Program Files\PostgreSQL\8.4\include [Linker -> General -> Additional Library Directories] C:\Program Files\PostgreSQL\8.4\lib [Linker -> Input -> Additional Dependencies] libpq.lib Note 2:At the end of this example, you will need to copy your project output (EXE) to ..\PostgreSQL\8.4\bin. Alternately, you can copy all DLLs located at ..\PostgreSQL\8.4\bin\ to you project output folder. We will start the coding part in our cpp file now. Make sure that you include the following header accordingly. libpq-fe.h must be included. Now we start our very first functon named CloseConn(). This function will make sure that we close the database connection accordingly. Next, we create a function named ConnectDB(). This function will establish a connection to PostgreSQL server. Please be sure that you provide the correct parameters in PostgreSQL(). Prior to this example, i have setup a database called testdb with user password of test123 during the installation. You might need to modify it accordingly in order to make sure the compilation success. Next, we create a function named CreateEmployeeTable(). This function will create an employee table in our testdb database. Next, we create a function named InsertEmployeeRec(). This function will take 2 parameters, fname and lname in char pointer type, to form a SQL statement. It then will be executed in order to store the record into the employee table. Next, we create a function named FetchEmployeeRec(). This function will fetch all the record in employee table and display it on the console windows. Next, we create a function named RemoveAllEmployeeRec(). This function will remove all record in employee table. Next, we create a function named DropEmployeeTable(). 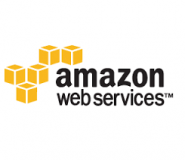 This function will drop or remove the employee from the testdb database. Finally, we update the main entry point function so that it call all the functions that we have created to demonstrate what we intend to show in this example. I’m getting these errors, the tutorial don’t explained well how to organize those files for newbies like me. Excellent tutorial. Shame that the source code boxes are so squished. It helped me out massively regardless. I am a beginer of c++ and PostgreSQL, This tutorial help me so much, It passed build with no error and work well for the first time. Thank you!Could you give me more materials about integrating the PostgreSQL into the C++ project? Nice tutorial, but I also get the same errors as Reinaldo C. Filho. Note 1: You might need to change the following file path accordingly. i am beginer in this so can anyone give step by step instruction to solve this error ????? i am beginner in this so can anyone give step by step instruction to solve this error ????? Problem from my last message (on April 15th, 2011 10:18 pm) is solved (partially). Last I tried to work on VS2010 and x64 PostgreSQL Installer version 9.0.4-1. I got errors listed in prev. message. The solution I found is to use VS2005 and PostgreSQL Installer version 8.4.8-1. It all works fine now. Any ideas how to get it working on VS2010? it’s work on me, and now i can get to the next level. I am planning on loading a high volume of records off a data stream into an existing table. The tutorial is for a simple case of loading one record at a time but if you had 1 million records to load quickly what would be the best way using C++ and postgreSQL? i install postgresql 8.0.1 in redhat.and i write the tutorial but failed. I needed most basic yet whole example of PostgreSQL implementation through Visual C++ as example to point to … This was more than enough . Thank You Very Much for Your effort . Thanks a ton for the insightful tutorial ! I have been searching for such a tutorial for months !! I am getting an error related to the _TCHAR not being able to be resolved. Could you tell me what equivalent that I need to add/change for eclipse on my MAC? I am looking the same but using free GNU, like codeblocks, I can have a run connection to postgre. My first shot to pqSql ever = successfull! If we have postgres\bin in the path why those 4.5 Mb of dll’s should be in (every) program directory? im using MVS 2010, thanks in advanced. I tried with VS2012 C++ Express together with PostgreSQL 9.1.3 in my 32bit Windows 7 dev machine and it seem that this tutorial is compatible with PostgreSQL 8.x and VS2005 as well. Please check your C++ project properties and make sure that you have the following setting in place. The linking errors you are getting depend on the platform you are using. If you have 32bit postgres, complie the source as Win32. For 64bit postgres use x64 platform. With VS 2008 and PostgreSQL 9.1 it does NOT WORK !!!! What is wrong: VS 2008 or PostgreSQL 9.1 ???? Has someone compile successfuly with these software ? Attentions what version you installed on windows x32 or x64 ! Many thanks to author for this tutorial! But I had the same problem with postgreses > 9.0. Probable, this errors occurs because of mismatch of header and lib file. put all this files on top. 4 – open the cmd prompt, and go to the folder PostGreSQL/9.2/bin. In cmd, type: implib -a libpq.lib libpq.dll. Go to the ProjectManager, in Builder Cpp, and in your project add, the libpq.lib, generated by setp 4. Build and Make your project. Select store path as ABSOLUTE. Go back to netbeans clean and build project (Shift + F11) !! For some reason libpq only works in cdecl c++. doesn’t work with stdcall. Have to declare the code calling it cdecl, but it links fine to stdcall code. Very weird. Yes, Postgres 64’s distribution doesn’t work contain a Win32 LIB. That’s pretty dumb. If you have a Win64 system of course you’ll install the 64-bit version, but that doesn’t mean every application you write will be 64-bit. Far from it. 32-bit is fine most of the time. Postgres distribution should contain both win32 and win64 so you can use either API from either. These linking problems have been around for many years. About time Postgresql cleaned them up. Why put so many people through unnecessary torment? Very nice example! However, I need to use this library in Eclipse C++ CDT, and I’m not sure whether it can hold the libpq.lib (I think it uses .a libraries). Can you say how is it done in Eclipse? BTW, I use Windows 7 – 64 bits, and Eclipse Kepler. I am using C++ with Windows 7. Where are PQconnectdb, PQstatus, `PQfinish’, etc? My friend I really enjoyed your tutorial, I’ll try later at my home with Visual C++.